I offer the following observation, subject of course to expert comment. System" and any physical components that were a part of it. aware that there is a system. just as the Proxy can provide summary information for the Local  Services. for the Proxy to just communicate with each Cloud Service independently. interface with each Cloud Service and each local service. had previously agreed to and that seem inconsistent with the Semantic Model. Proxy. IPP Server + Print Service == IPP Printer. extent that it acts for the imaging services. interface, etc. ), which gets it from the local system control service. 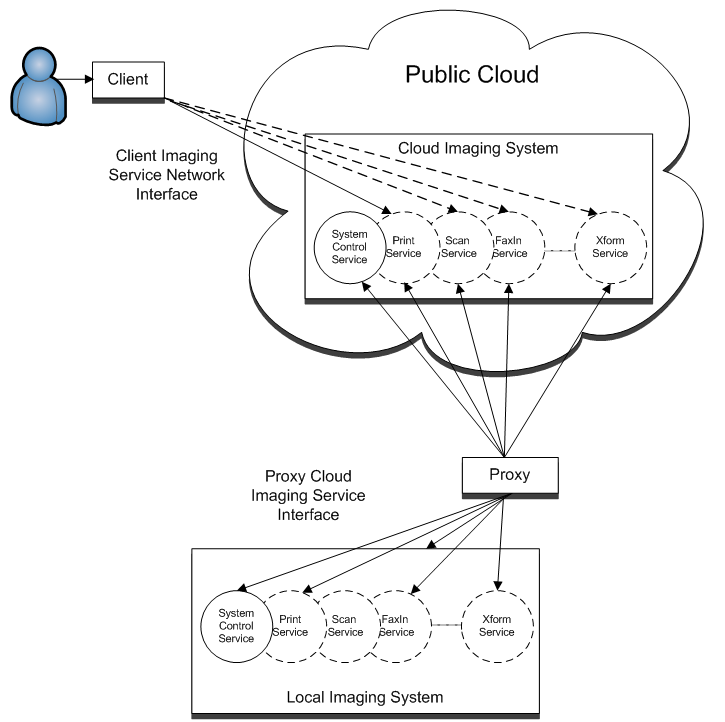 beyond the Proxy, a Local Imaging System. service boxes to be "system control service and system object"? "Device"  as an actor in the cloud specification, in favor of System. the Semantic Model and IPP notions of separation. seem reasonable that it could also trigger an Identify via this path. agree IdentifyDevice is one of the expected operations. schema and WSDL files is an XML-RPC server talking to an Imaging Service.